On Friday, December 12, I had the profound pleasure of attending the Kessler Award ceremony hosted by The Center for LGBTQ Studies: CLAGS at The Graduate Center, CUNY in honor of Professor Cathy J. Cohen (University of Chicago). Cohen has a large body of work at the intersection of race, class, gender and sexuality, but is perhaps best known for a 1997 GLQ article, referenced this talk, called, “Punks, Bulldaggers and Welfare Queens: The Radical Potential of Queer Politics” (locked). The title of her talk was, “#Do Black Lives Matter? From Michael Brown to CeCe McDonald: On Black Death and LGBTQ Politics.” What follows is a brief summary of her remarks, and the video and transcript are linked below. Colorblind racial ideology, by both decrying racism and designating anti-racism as probably one of the country’s newly found core values, actually works to obscure the relationship between identity and privilege. Thus, through colorblind ideology one can claim to be in solidarity with black people while at the same time denigrating the condition of poor black people, faulting them for their behaviors or lack of a work ethic and not their race. Moreover, one could declare that ‘black lives matter’ while undermining any state-sponsored programs that would address the special needs of poor black people. One could say, in fact, that I’m heartbroken with the death of Trayvon Martin because if I had a son, he would look like Trayvon, and recognize that that means nothing in terms of justice for black people. In many ways, Russell here articulates Cohen’s vision for transformational politics and what she refers to as substantive, rather than performative, solidarity. Cohen, along with a growing chorus of voices, sees what is happening now as a movement, rather than simply a momentary response to aggressive policing. You can view Cohen’s lecture online here (beginning about the 25:50 mark). A transcript of Cohen’s remarks is available here. Over the weekend in New York City and Washington, DC thousands of people marched in protest against racist police violence in the deaths of Eric Garner, Michael Brown, Trayvon Martin, Oscar Grant and so many others. The march in NYC, which I attended, was a multi-ethnic, multi-racial crowd of people from many different backgrounds. While there were folks there of all ages, the march was youth-led and organized, mostly through social media and with little to no money, as Linda Sarour observed on Twitter. The #climatemarch was 14 months of planning and they had tons of $$$$$$ – #MillionsMarchNYC organized in 10 days w/ minimal resources. I took a bunch of photos that day, but lost them in an ill-timed software update on my phone. 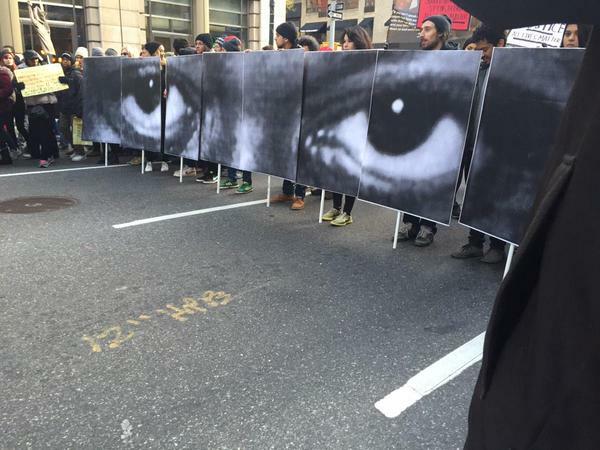 It’s just as well because none of my photos were as good as some of the others, like this one of a haunting series of posters of Eric Garner’s eyes. This is a movement, not a moment, and on Saturday I was humbled to be able to walk as part of it. Today, I’m grateful that I’ve lived long enough to see the start of this movement. The forceful rhetorical assertion of our community has multifarious consequences. It counts individuals in the “our community” whose everyday experiences in that institution are not characterized by such a warm and fuzzy inclusion. As Kiese Laymon’s How to Slowly Kill Yourself and Others in America powerfully asserts, this purported inclusion is tenuous at best. He and others are consistently reminded of the transgression their inclusion in this historical and still white institution entails. Such assertions of our community incorporate people who do not experience inclusion in their daily lives – and do so without their consent and without their voices. Writing that this is a troubling and “challenging time for our community” also suggests that it is the institution itself that is suffering. As Sara Ahmed notes in On Being Included: Racism and Diversity in Institutional Life, such rhetorical work is not uncommon when academic institutions of higher education come under such fire. It dilutes the critiques by applying them to the whole community, rather than recognizing the unequal distribution of suffering which is leveled at particular groups by that very community. The dream is a community that supports everyone. Where everyone feels safe and supported. Where everyone’s well-being is ensured. A true academic utopia. That goal is unachievable. It is impossible to make all those who live, study and work at Vassar feel safe and supported. How can you make both people of color and those who maintain a possessive investment in whiteness comfortable? Kiese Laymon, a black male English professor at Vassar, prolific and published author, writes that a white senior professor said he could speak in Ebonics to him if he liked. Eve Dunbar writes of a senior black female colleague who told her others in her department would not support her receiving tenure because, as a black woman, she had nothing to offer white people. The rhetoric of our community and of universal support ignores the obvious impossibility of creating a supportive atmosphere for both the black professor and the colleague who denies that said qualified black professor deserves tenure. During my time as an undergraduate at Vassar, a black female professor found a piece of wire fashioned into a noose attached to her office door. If I remember correctly, it was constructed of paperclips. What that professor experienced was much more than a single unnerving threat of racial violence. I cannot even imagine what that was like for her. It would be a disservice to her experience, and to the discrimination other people of color have faced at Vassar, to think that I could. But I do know that after that threat, there were no official campus-wide messages like the ones I am now receiving in my inbox. If that professor hadn’t had the courage to share it with us, a group of students, I never would have known. The internet suggests she no longer works there. How can you make students, staff and faculty of color feel safe while you also offer support to those who institutionally maintain white supremacy and enact it interpersonally? How can you support the well-being of those who find imitations of nooses at their office doors and those who make them? President Hill, it is impossible to make everyone supported and everyone comfortable while dismantling white supremacy and racial discrimination at our institution. And I say our institution here purposefully. Without downplaying the important issue of sexual assault on college campuses throughout the US, I, as a white woman, am not sure I ever felt truly unsafe during my time at Vassar. Indeed, I am in many ways what Nirmal Puwar calls the somatic norm of that institution. Vassar, a liberal arts college founded for women in 1861, is an institution made for people like me. I am a white Vassar legacy. I love Vassar. It is the only college to which I applied for my undergraduate degree, because it is the only place I wanted to go. But it is easy for someone like me to love Vassar. I never had to struggle to love an institution that also shunned me, that pulled me close while pricking and prodding me. I was never figuratively burned and I never suffered the indignities of which Dunbar writes. It was in this safe and supportive, and exclusive, atmosphere, in what we all called the “Vassar bubble,” that white supremacy and racism could continue. It was in feeling so secure in our self-congratulatory progressive politics that we could continue to make racist jokes—because we knew we knew better. Or at least that’s what we told ourselves. That is the We I knew. That is the our community in which I earned my undergraduate degree. These issues go beyond Vassar. Comments to Laymon’s and Dunbar’s pieces from institutions around the country make that abundantly clear. And I wish I could say I had not seen or heard of analogous instances of racial threats, white ignorance and institutional silence since the noose or my years at Vassar. I cannot say that. We need to make a lot more people nestled in white privilege uncomfortable and take institutional steps to dismantle that privilege, not give them equal opportunities to speak. I think we’ve spoken enough. And talking is not enough. Note: This is the second part of a two-part series. See the first part here. One of the effects of living in a racially segregated, poor neighborhood is the exposure to cultural traits that may not be conducive to facilitating social mobility. If, in the course of concealing his failure, or of concealing his fear of even trying, [the street-corner man] pretends—through the device of public fictions—that he does not want these things in the first place and claims he has all along been responding to a different set of rules and prizes, we do not do him or ourselves any good by accepting this claim at face value. It makes little sense to compare—as Wilson does—the culture of a pariah class with that of mainstream youth, putting aside the fact that white suburban youth also strut around in saggy pants, listen to hip-hop music, and are far more prone to drug use than are their ghetto counterparts. Wilson’s theoretical postulates about “deconcentrating poverty” have also led him to support the demolition of public housing across the nation. Is this how cultural change takes place, with dynamite, the destruction of poor communities, and the dispersal of its residents? Or do we have to transform the ghetto itself, not by reconstructing the identities of its people, but through a wholesale commitment to eliminating poverty and joblessness? Structural factors are likely to play a far greater role than cultural factors in bringing about rapid neighborhood change. But what structural changes does he have in mind? Despite the fact that Wilson’s signature issue for many years was jobs, jobs, jobs, since his cultural turn there has been nigh any mention of jobs. Affirmative action is apparently off the table, and there is no policy redress for the nation’s four million “disconnected youth” who are out of school and out of work. Never mind; the die is cast. With Wilson’s backing, the Obama administration has made HCZ the model for twenty “Promise Neighborhoods” across the nation. At best, however, HCZ is a showcase project that, even multiplied twenty times, is no remedy for the deep and widening income gap between blacks and others. At worst, the Obama administration is using it to camouflage its utter failure to address issues of racism and poverty. The new culturalists can bemoan the supposed erasure of culture from poverty research in the wake of the Moynihan Report, but far more troubling is that these four decades have witnessed the erasure of racism and poverty from political discourse, both inside and outside the academy. The Annals issue makes virtually no mention of institutionalized racism. To be sure, there is much discussion of poverty, but not as a historical or structural phenomenon. Instead we are presented with reductionist manifestations of poverty that obscure its larger configuration. Thus there is no thought of restoring the safety net. Or resurrecting affirmative action. Or once again constructing public housing as the housing of last resort. Or decriminalizing drugs and rescinding mandatory sentencing. Or enforcing anti-discrimination laws with the same vigor that police exercise in targeting black and Latino youth for marijuana possession. Or creating jobs programs for disconnected youth and for the chronically unemployed. Against this background, the ballyhooed “restoration” of culture to poverty discourse can only be one thing: an evasion of the persistent racial and economic inequalities that are a blot on American democracy. The methodological reductionism that is the hallmark of the new culturalists is a betrayal of the sociological imagination: what C. Wright Mills described as exploring the intersection between history and biography. Instead, the new culturalists give us biography shorn of history, and culture ripped from its moorings in social structure. Against their intentions, they end up providing erudite justification for retrograde public policy, less through acts of commission than through their silences and opacities. Note: Portions of this post appeared in a 2011 The Boston Review article.